Description: "Death has defined the Island. Horrific, costly, spiraling and surprising death. Yellow Fever. The Civil War. Ravaging fires. Hurricanes. Tragic and unexpected. Yet Galveston is not a household name like other ghost towns such as New Orleans, a fact which makes the Island's extreme paranormal context that much more unique. Perhaps more than any other American city, Galveston is both literally and figuratively haunted by its past - the devastation of events rattle like chains in the attic - a constant, steady, and invisible force beyond which life struggles. Come inside and explore Galveston's historic and haunted past. 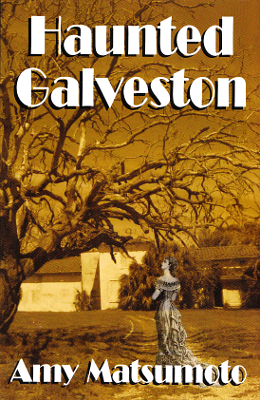 In the pages of this book, you will find tales of Matilda, the spirit who haunts the city's beloved Broadway mansion, Ashton Villa, the Tremont Hotel where guests and employees alike report unexplainable events, Galveston's haunted ruins like Stewart's Mansion and the elegant Galvez, where ghostly happenings are pervasive throughout the hotel." Viewed: 2,068 times since October 18, 2013.